New York, Jan 31 (IANS) Apple sold a record 22.39 million smartphones in the US in the holiday season last year, increasing its market share from 37 per cent to 44 per cent — the highest ever for Apple on home turf, a new report said on Wednesday. Since its launch on November 3, with nearly eight million units sold, iPhone X outsold iPhone 8 and iPhone 8 Plus by a 2:1 margin in the US. According to Counterpoint Research’s "Market Pulse programme, 51.2 million smartphones were sold during the holiday season quarter of 2017. "Apple shipped a record 22 million iPhones for the first time ever in a quarter in the US which is an impressive feat because the Q4 promotional season was not nearly as aggressive as previous years," Research Director Jeff Fieldhack said in a statement. "Apple was able to grow their sell through 20 per cent in a market that only grew 2 per cent compared to last year. 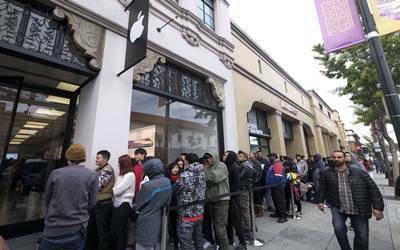 This means Apple has been successful to take share away from Samsung in the premium segment," he added. There are reports that iPhone X has disappointed on a global level, including in China, and the higher price ensured the demand remained softer than expected. "But this has not been the case in the US market. The consumers, on an average, are probably on their third or fourth iPhone and are willing to pay for the Apple ecosystem which is much stronger in the US than, for example, in China," said Research Director Neil Shah. Subway Restaurant in Indiana Engtlish needs speaking person. Attractive salary and Accommodation provided. Motel Manager couple needed for 19 room Motel, only 50 minutes North of Chicago. good Salary. Accommodation wil be rovided. Motel Help in Motel 6 Peoria area, IL.Needed Manager, Front Desk Position and Housekeeping. Legal Status must. Accommodation will be provided. Tax service for personal and small business. Max refund and free efile prompt, confidential, affordable & lower rates.